Which is the country with the highest wild cat diversity? That’s right- India. Fifteen of the forty cat species that comprise the family Felidae, are found in India, with the greatest diversity within India occurring in the north-eastern states. 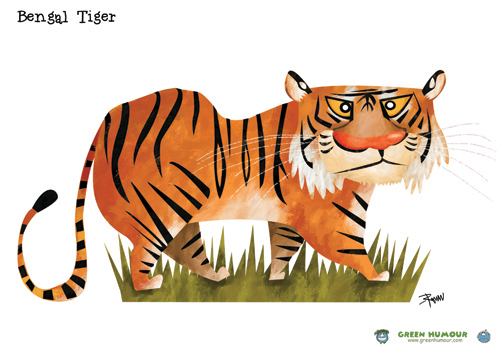 India is also home to both the largest wild cat (the Tiger) and the smallest (the Rusty Spotted Cat). (The Cheetah used to roam the plains of India until it was extirpated in the twentieth century.) 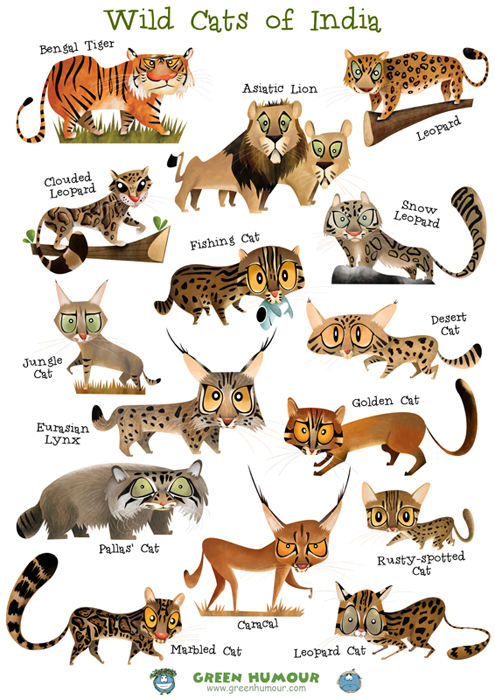 Here’s a caricatured conglomeration of India’s wild cats: 5 charismatic big cats, 10 enigmatic small cats, one big poster! Our national animal and one of the most alluring species on the planet, the Bengal Tiger is an animal with which India is associated and identified with the most. Best seen in the jungles of Cenrtal India, tigers have not only boosted tourism in the region but have also driven conservation. Poaching, habitat loss and fragmentation along with several other problems are causing a steady decline in the tigers’ numbers. 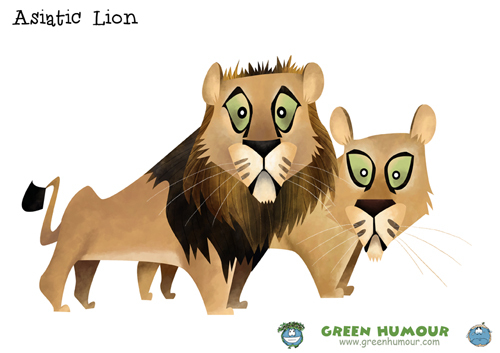 The Asiatic Lion is a lion sub-species that exists only in Gir in Gujarat, where 400 of these majestic beasts live. Their small population is threatened by inbreeding, disease and conflict with humans. The male sports a scanty mane unlike the dense hair of its African cousin. The pride size is also significantly smaller than those of African lions. Its extreme adaptability, opportunistic behaviour and stealth make the leopard the most successful of the big cats. The leopard possesses an exceptional climbing prowess and is even able to carry heavy prey up a tree. It is poached heavily for its skin and parts and is facing a grave threat from habitat loss and man-animal conflict. The glorious Snow Leopard is a holder of many world records. 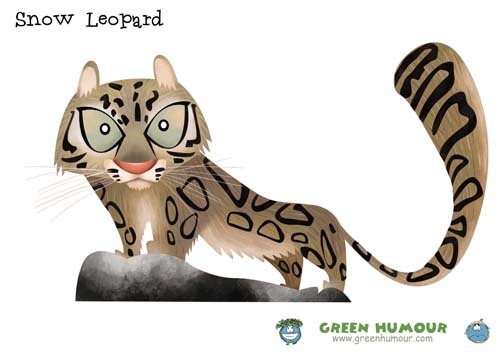 It is the highest living land predator and is the only big cat that cannot roar. It also has one of the longest tails in proportion to the body length, which is used for balance and for wrapping around the body like a blanket to keep warm. The snow leopard is a master of camouflage and stealth. It is threatened by habitat loss, poaching and conflicts with sheep herders. This gorgeous cat is the smallest of the big cats and dwells in the Himalayan hill forests of the North-East. Poached heavily in the region, it is listed as Vulnerable by the IUCN. They are considered among the most talented climbers in the cat family and among the few that can climb down vertical trunks head first. 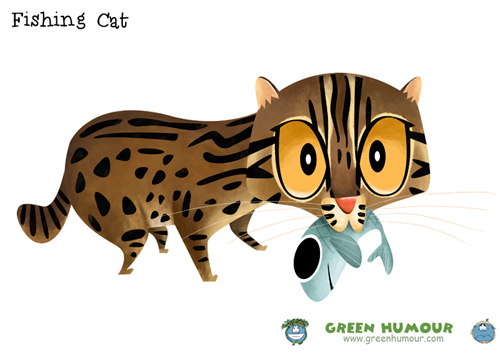 The Fishing cat is a resident of wetland habitats and is classified as endangered owing to habitat loss. They are good swimmers and are primarily nocturnal. Fish comprise their main prey but they may also eat rodents, amphibians and carrion. The Jungle Cat is India’s most common wild cat. It is active both during the day and the night and is an efficient hunter, thriving in a variety of habitats. It preys on a variety of rodents and birds, and has been reported to kill animals larger than itself, such as porcupines. The Desert cat inhabits the arid regions of North-western India. The closest wild relative of the domestic tabby, it often interbreeds with domestic cats in its home range. Among Indian small cats, it is exploited the most for its fur, and poaching is a significant conservation threat that the species faces. The northern Himalayas form the southernmost part of the range of the Eurasian Lynx, which occurs throughout Eurasia. It can be distinguished easily from other small cats by the long ear tufts, which are thought to enhance hearing. Their furred paws act as snowshoes, aiding locomotion in the dense snow cover of the higher Himalayas. The Pallas’ Cat or Manul is a rather odd-looking but endearing cat, extremely shaggy in appearance. Its flat face sets it apart from its cousins. The thick, dense fur help it keep warm in the harsh conditions of Ladakh, the only region where it occurs in India. It hunts a variety of rodents and birds, often on mountain slopes. An extremely secretive felid, the Golden Cat to me is the most attractive of all cats in India. It resembles the Mountain Lion of the Americas in appearance, but is much smaller and has short black stripes on its face. Found in the hill forests of North-east India, it is an extremely rare animal to come across, and is often reported from camera trap images. It ranks as ‘Near-threatened’ on the IUCN Red List owing to poaching and habitat loss. 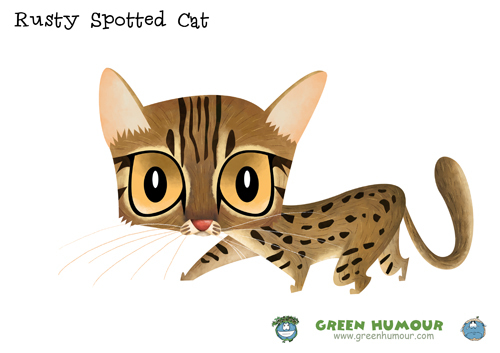 The Rusty Spotted Cat is the smallest wild felid in the world, and is found through much of peninsular India. It is nocturnal in habit and extremely shy, and is hence not commonly encountered. The unmarked tail is an identification tip for this species. It is also known to be very tolerant of human presence, often inhabiting the fringes of human habitation around forests. This beautiful, elusive cat is another denizen of the hill forests of North-east India, where poaching and deforestation have led it to be classified as ‘Vulnerable’ by the IUCN. The Marbled Cat is an extremely agile climber, with its extraordinarily long tail serving as counterbalance. The thick, dark spots give it the appearance of a miniature Clouded Leopard. This miniature version of the leopard is not only similar to its larger cousin in being spotted, but also shares its adaptability. It is the second most common small cat after the Jungle Cat, and thrives in a variety of habitats. It is usually arboreal and hunts rodents and birds. 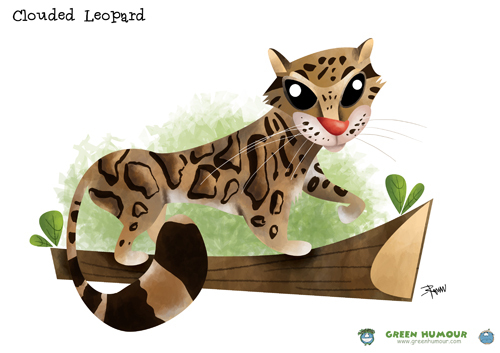 Although listed as a ‘Least Concern’ species, it faces a significant threat from hunting and habitat loss. The gorgeous caracal is one of the most sought-after small cats among cat aficionados. The arid equivalent of the lynx, it occurs in a wide range, from Africa through Central Asia to North-western India, where it is an extremely rare animal to encounter. 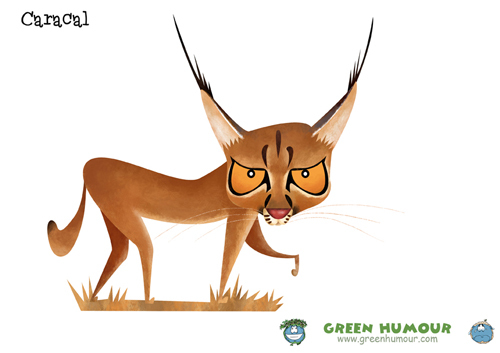 The long ear tufts and the long legs give the caracal its characteristic feline grace. It feeds on a wide range of prey including desert rodents, birds and even small deer. Go on, mail me your orders (rohanchakcartoonist@gmail.com) and turn your house into a wild cat sanctuary! For orders outside of India, please click here to buy wild cat prints and goodies on my Redbubble store. How to place order and what about payment style??? Hello Niyati, please mail me your orders, postal address and contact number on rohanchakcartoonist@gmail.com. Was directed here by Deepa Mohan, to observe the birdwatchers. Am also a cat-caretaker, really like your cat images!